A special mom gift for birthday, Christmas, wedding, thank you or Mother's Day. 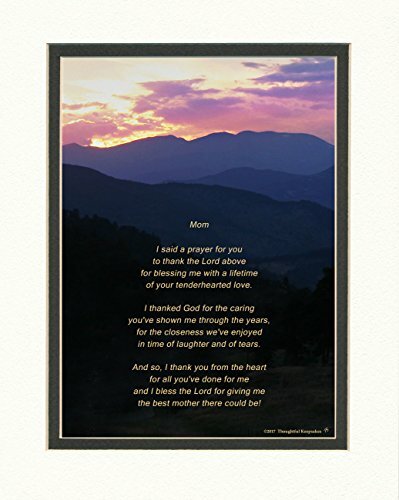 This beautiful photo of multi-colored layers of mountains with a spectacular sunset includes the poem: includes the poem: Mom (above poem) I said a prayer for you to thank the Lord above for blessing me with a lifetime of your tenderhearted love. I thanked God for the caring you've shown me through the years, for the closeness we've enjoyed in time of laughter and of tears. And so, I thank you from the heart for all you've done for me and I bless the Lord for giving me the best mother there could be! If you have any questions about this product by Mom - Mother Gifts, contact us by completing and submitting the form below. If you are looking for a specif part number, please include it with your message.